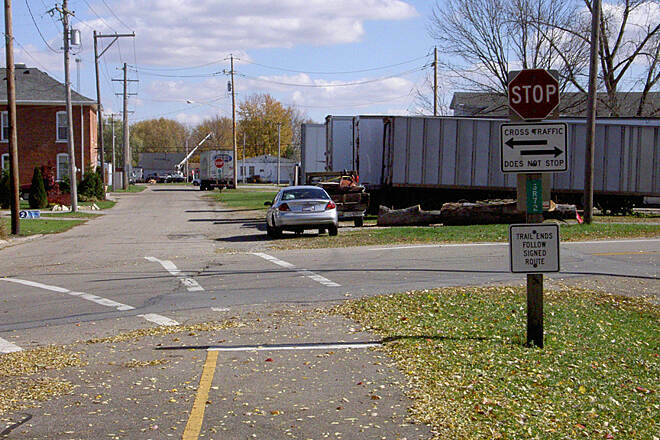 The Xenia–Jamestown Connector links these two eponymous communities and travels east beyond Jamestown to the Greene–Fayette County line at Rosemoor Road. 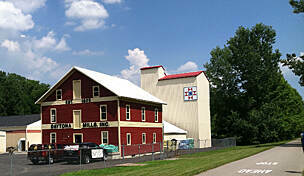 It’s part of Ohio’s Miami River Valley trail system, one of the nation’s largest networks of paved, off-street trails. 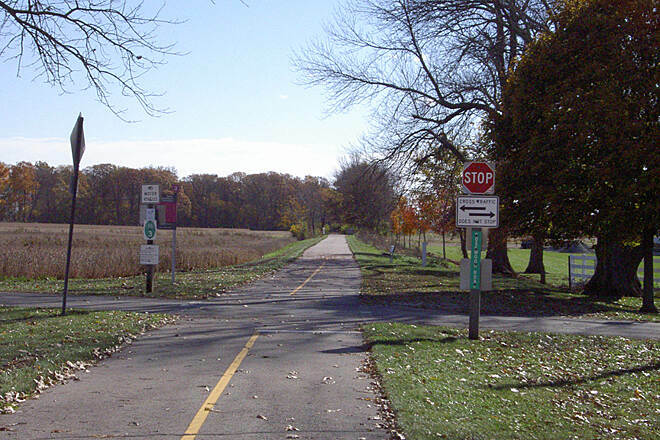 From its starting point in Xenia, the path is less than 0.5 mile from the trail hub at Xenia Station, where you can pick up the Little Miami Scenic Trail, the Creekside Trail, and the Prairie Grass Trail. 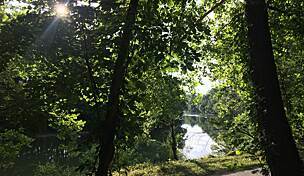 From Washington Street in Xenia, you’ll pedal southeast out of town, largely under a thick canopy of trees. 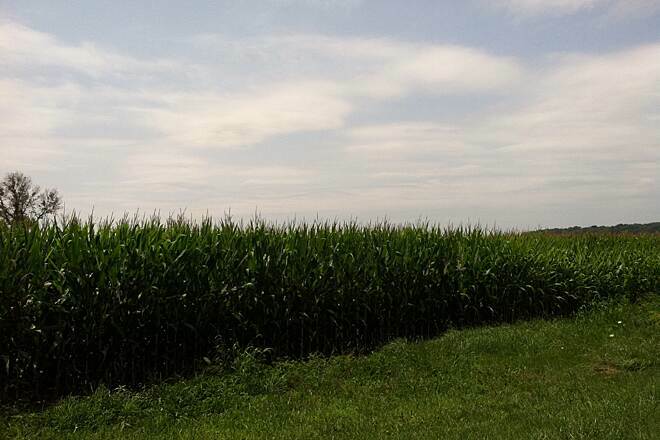 You’ll pass under US 35 and continue through a mixture of forests and vast farm fields that dominate this part of central Ohio. 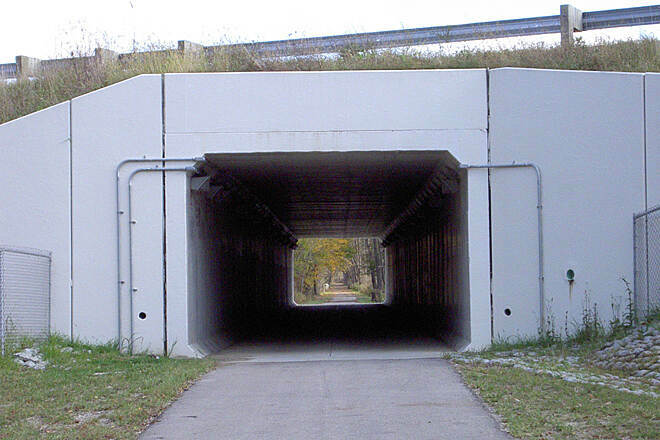 From the underpass, it’s 2.7 miles to South Monroe Siding Road. 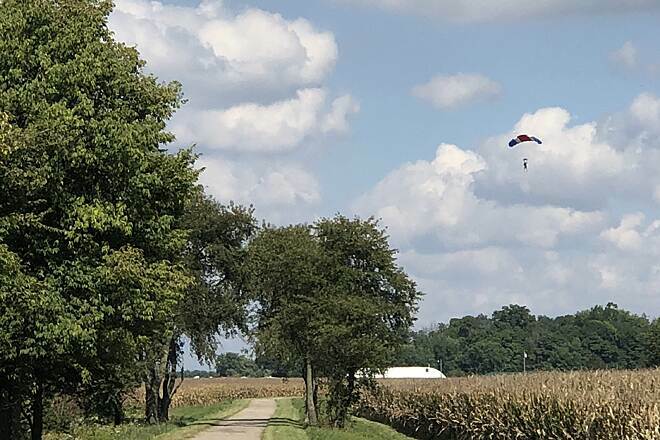 As you approach the roadway, look to your left and you’ll see a small airfield for Skydive Greene County, which offers skydiving opportunities; on a nice day, you may see airplanes taking off and landing, and parachutists in the sky. After another 2.4 miles, the path crosses the North Branch of Caesar Creek. 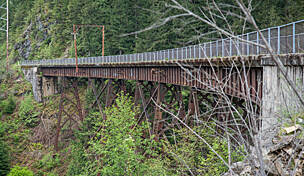 The bridge has a nicely built concrete deck and scenic views both up and down the meandering waterway. With lush vegetation clinging to the banks, it is well worth a stop. 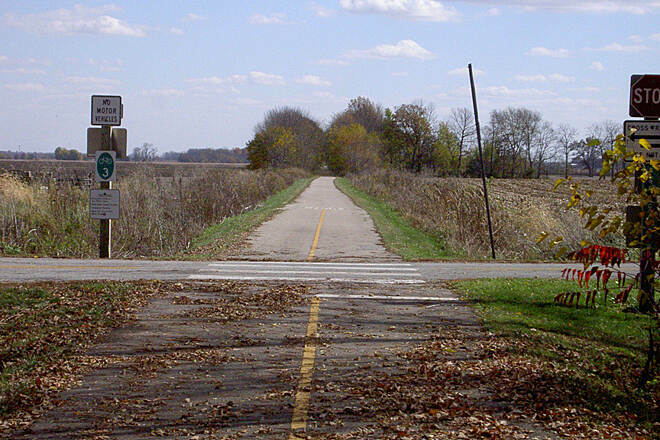 From the creek, it’s 3 miles of rural riding before you reach a well-marked crossing of Quarry Road. About 0.5 mile farther and you’ll come to a spur on your right leading south into Frank Seaman Park. 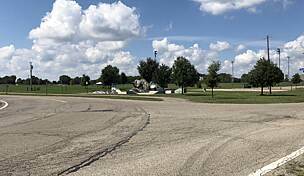 The park supplies ample amenities, including restrooms, water, parking, and a picnic area, as well as ample green space to unwind. From the park, you enter Jamestown. 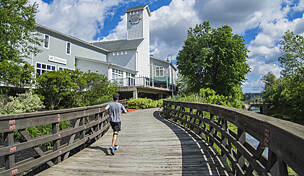 The trail experience here becomes busier, with a mix of residential and commercial areas close at hand. 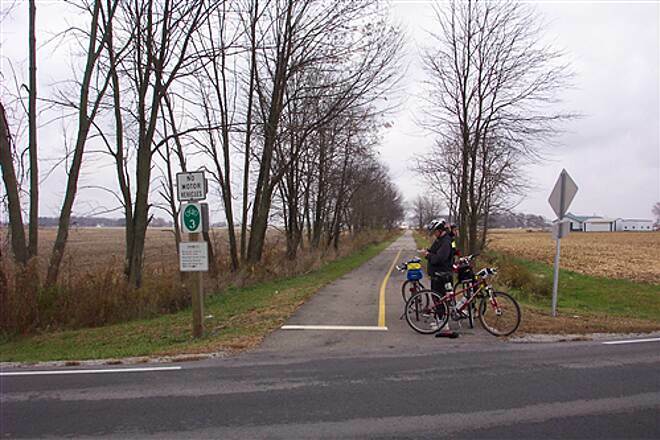 As you leave town, the last 4 miles of the route become rural once again to the trail’s end at Rosemoor Road. 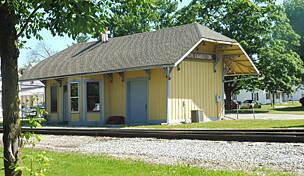 To reach Xenia Station, near the north end of the trail, from I-675, take Exit 13A, and head east on US 35. In 6.6 miles, veer right to remain on US 35 E toward Washington C H. Continue 2.5 miles, and exit onto US 42. Head north on US 42, and go 1.2 miles. Turn right onto S. Miami Ave., and turn left into the station parking lot in 0.4 mile. For the southern end of the trail, the best parking can be found in Frank Seaman Park. To reach the park from I-71, take Exit 58. Head north on OH 72, and go 5 miles. Turn left onto Jasper Road, and go 2.3 miles. Turn right onto Waynesville Jamestown Road, and go 1.8 miles. Turn left onto Cottonville Road. Just 0.8 mile down the road, look for Greenview High School on the right. Access Frank Seaman Park by going through the high school parking lot and turning right. Well-maintained tree-lined path through beautiful country. It’s flat, so it’s an easy place to log some miles. I had to tell all my friends about this! 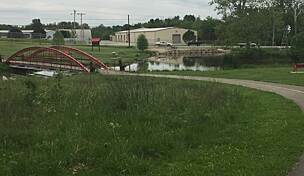 I hear there is a hotel motel or bed and breakfast and I think bike shop bike club opening right on the bike path Xenia Jamestown connector right on Verity St. & S. Church. That is so cool and convenient, we use to have to travel back to Xenia or Jeffersonville that is not on the east portion bike path. I will also be the first to try the inn, tent or room with hot water and soft bed and air conditioning or heat depending when I go. Great ride from Xenia to Jamestown! 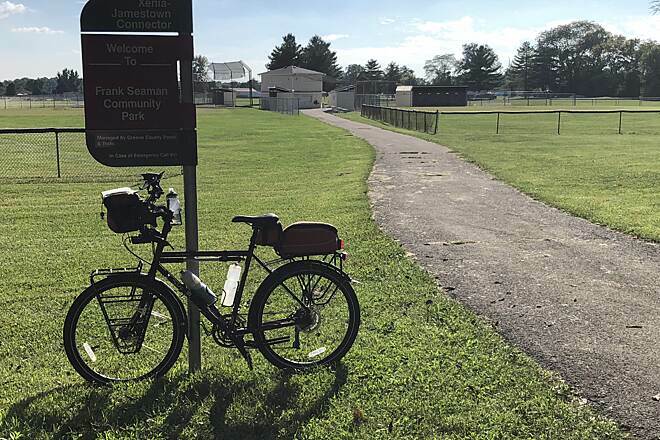 A friend and I rode this trail as part of a 12-day, 460 mile “Tour of Ohio Trails” – riding as much of the network of Miami Valley trails as we could. 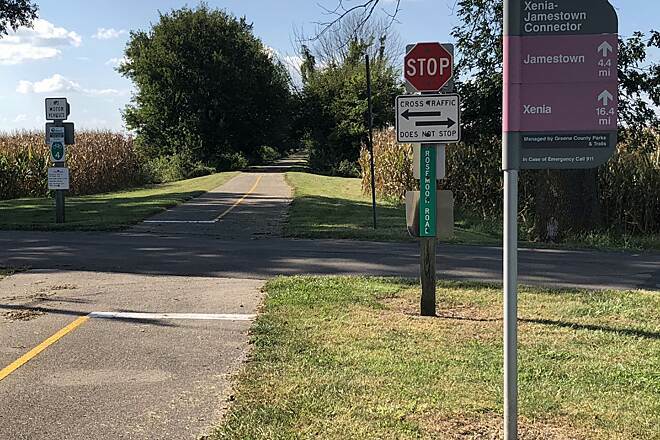 The Xenia–Jamestown Connector Trail goes from Xenia to Jamestown of course. 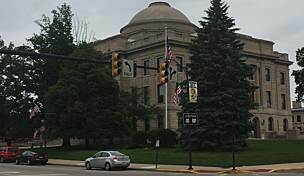 Xenia is a much bigger city – Jamestown is small. 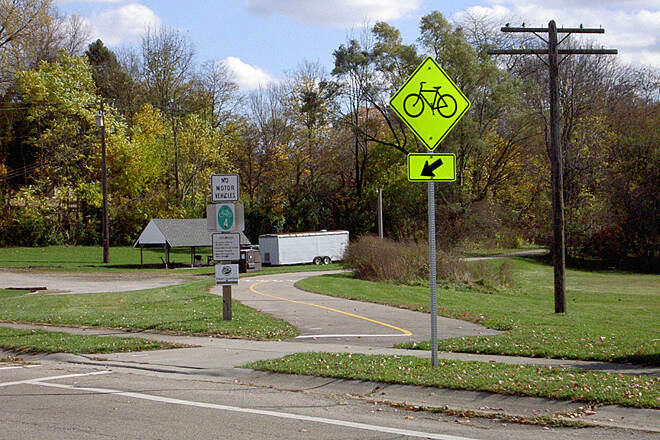 This trail is part of Ohio’s Miami Valley trail system, an AMAZING network of trails (which I intend to ride ALL of). This is a very straight, lovely trail, mostly shaded through some farmlands and leads to Jamestown where we found the most fun, amazing café - Kelley’s. DEFINITELY go there. Very good food/beer/service/reasonable prices/patio dining, etc. etc. 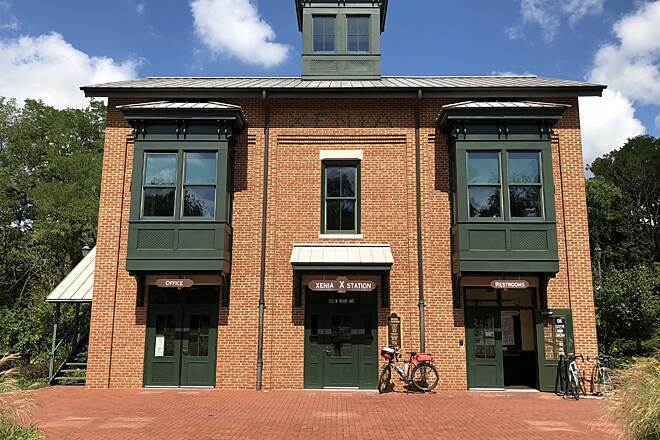 We rode from Xenia to Jamestown and back (22.6 miles) as part of that day’s “travels”. We enjoyed this part of the ride as part of a much larger ride, but if we lived in the area, I would be a regular rider on this section! 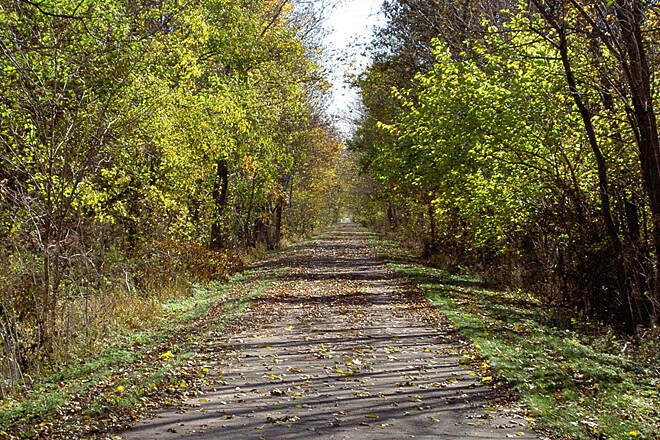 It is a well-maintained multi-use paved path. Heaven to ride on (especially if you have ridden a lot of crushed limestone paths!). 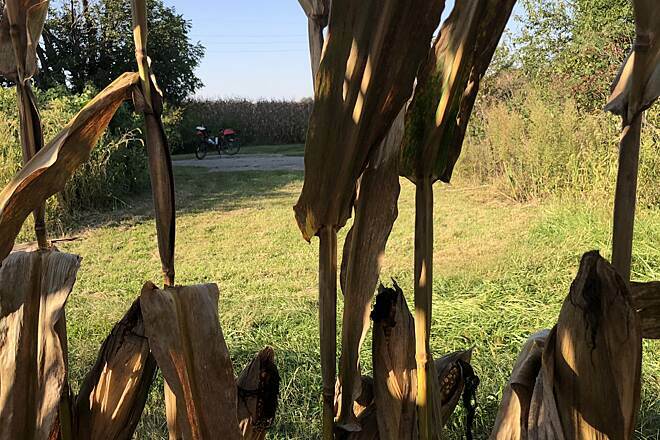 We did not go east of Jamestown (so we can’t evaluate that part of the trail) as we needed to ride back to Xenia to find lodging…we thoroughly enjoyed this ride. Added bonus - it was October, the temperature dropped unexpectedly, we didn't have enough warm clothes and Jamestown has a DOLLAR GENERAL - we went shopping and got WARM STUFF for next to nothing! 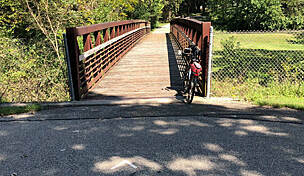 My wife and I rode from Corwin to Xenia on the Little Miami, then caught the connector to the end at Rosemoor Rd. from there, about 6 miles of country roads took us to a hotel in Jeffersonville. The Xenia-Jamestown Connector portion is very pleasant with lots of shaded areas. 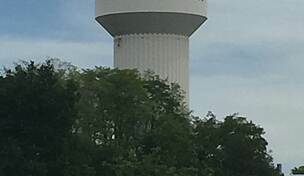 Views of bean and corn fields were frequent. It was interesting to see the skydiving, also. The only complaint is that the path, designated number 4 out of Xenia, is labeled 3 once you get near Jamestown and beyond. Since 3 is the Little Miami Scenic Trail, it was a bit confusing, making me question for a while if we were on the right one. Overall a very enjoyable ride for a couple in their late youth (mid-60s). The trail was very smooth and clean from Xenia to Jamestown. We watched three sky divers exit an airplane at the sky dive park mentioned in the trail description. The only let down was east of Jamestown the trail was a consistent mine field of tree limbs and sticks. 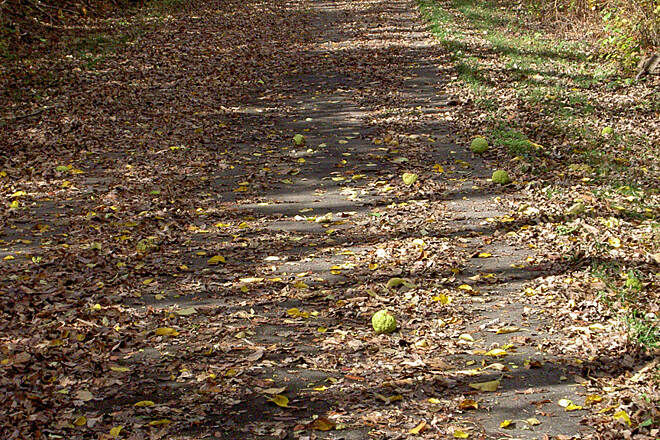 It seemed as if the recent mowing on the sides of the trail blew debris onto the trail instead of away from the trail. The trail was a mix of tree lined and places where you could see the countryside. We'll ride it again in the future, but will not go to trails end if it is littered like today. Rode the trail today, great ride. 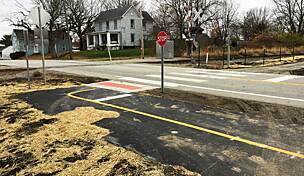 Please note that the new underpass for route 35 just east of Xenia is now COMPLETED. So no more detours on city streets to get around this. Starting from Xenia Station, it is about 2 blocks ob city streets, follow the well marked signs. From there it is all nice smooth blacktop trail all the way past Jamestown. 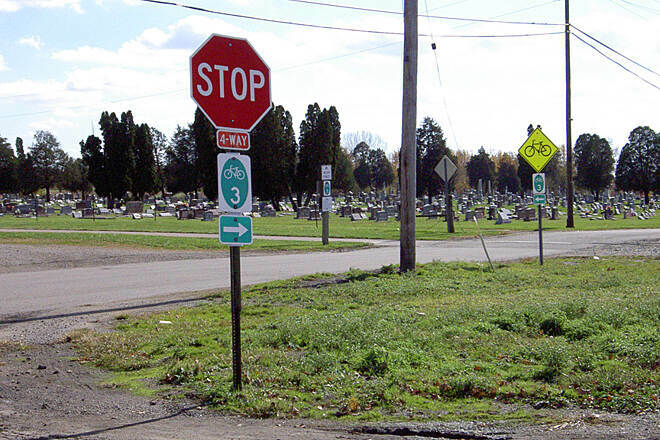 There are no obvious rest stops in Jamestown. But McD's and other food is just a block to the north. 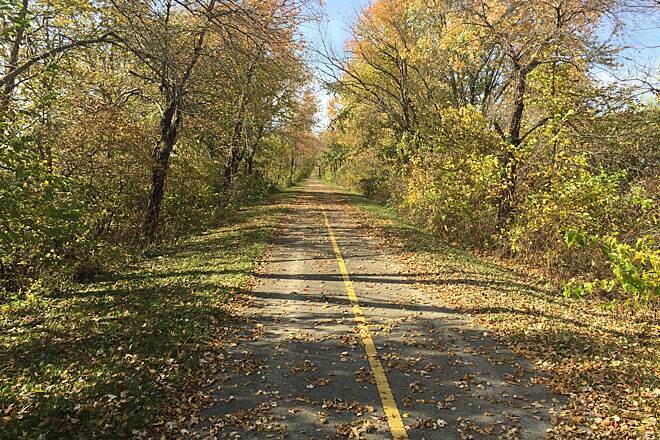 Having ridden this trail in mid-August, I'd like to share a few comments. Tanger Outlets ( formally Prime Outlets ) in Jeffersonville Ohio is about 3 miles from the eastern most end of the trail. As that end is closest to my house, I dropped off the wife and kids for a few hours of shopping and headed to the path. 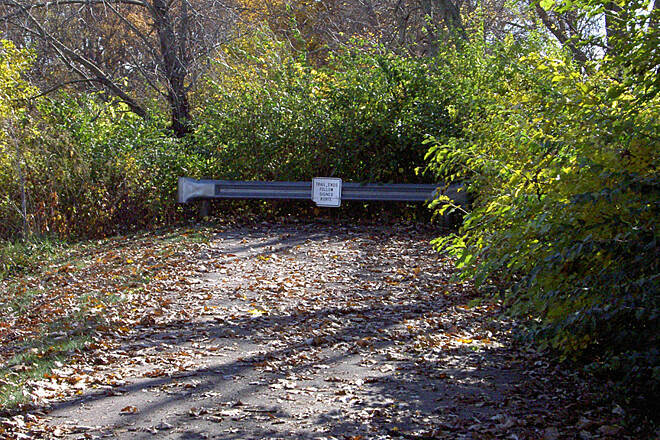 I parked beside the trail where it crosses Rosemoor Road at the eastern end. I'd estimate there is room directly beside the path for 5 vehicles at least. The trail is flat and runs thru mostly rural areas. At Jamestown it transitions’ to city streets for about 2 blocks; it’s a strait shot so you can't get lost. The trail was lightly used; I saw perhaps 12 folks in addition to myself each time. The trail is majority shaded; in fact I wore clear eye protection for the entire trail on a bright sunny day. I was treated to an unexpected show when riding by a small airport. I looked up to see 3 or four parachutists in the sky manipulating their chutes to land on the runway. 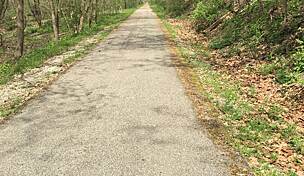 Compared to other Ohio trails I've experienced this trail was noticeably covered with numerous small broken branches ( sticks ) and more than the usual small rocks on the sections that had full tree cover. A few leaves and walnuts are expected this time of year of course, but the many sticks required a bit of caution to negotiate safely. At the western most end, the trail ends abruptly at Route 35; that section appears to be new as the asphalt is very black. Just before that end, as the path crosses S. Beckett Road, there is signage indicating a street route to ... presumably ... where the path picks back up on the opposite side of Route 35 and on to Xenia Station. My wife had a great time shopping with a local friend, the kids got some school clothes, and I had a pleasant ride in beautiful country. All and all, a wonderful day for all.